In a story, Humpty Dumpty sat on a wall before being yanked down in a beat cop Hot Stop. Had he budged, he would have been a scrambled egg. But being a good egg, Humpty complied with the law. In so doing, he became the target of dozens of drawn weapons, including a helicopter that whirred above his noggin like a foreboding eggbeater. Adding salt to injury, the event occurred only one-half block south of the downtown police station where Humpty was en route to seek refuge. He was seeking refuge because prior to the Hot Stop, an unidentified man had twice entered Humpty’s car (twice repelled), flailing his arms about in an aggressive manner and falsely yelling aloud that Humpty had a gun. Trapped in the driver’s seat of his vehicle, Humpty defended himself and a disabled female passenger (an elementary school teacher of the deaf) with his medically prescribed walking cane. You see, Humpty was cracked but not broken, as he was recovering from a multitude of maladies including arm surgery, a broken leg and a torn ligament. The latter two were sustained while he was employed at the local State prison. Humpty’s angry, macho assailant was hell-bent on retrieving an item Humpty had innocently picked up from a sidewalk because it had appeared to be a discarded object. (It had been abandoned in public view for over one hour.) Wary of conflict, Humpty gladly relinquished the item after the assailant drove his truck into Humpty's parked car and damaged the driver's side door. Aware of justice, he drove to the police headquarters to hash out the situation with the assaulter in pursuit. He knew his actions had been in self-defense. He thought the law would help. Au contraire. Although no criminal charges were filed against him, Humpty was arrested for assault with a deadly weapon (his aluminum cane) and bail was set at $30,000. Humpty didn’t demand an attorney to be present because he knew he had done nothing wrong. * The female detective who interrogated Humpty appeared eager for a conviction. While “seeking the facts”, she scolded him by stating her three children had more wisdom than Humpty Dumpty. She did so within auditory range of her colleagues. Divulging personal information to a potential inmate is considered fraternization in other law enforcement units, at the State prison anyway. Her paperwork was sloppy by inaccurately stating Humpty’s age and physical description. “I’m a slick, white oval egg,” thought Humpty “ Not fat with a goatee.” Again, sloppy police work. According to the assailant, Humpty had punched him in the face. Wrong. Humpty had to instruct the detective (as in Correctional Skills 101) that his knuckles had no bruises and were “clean,” indicating he hadn’t hit anyone. The detective told Humpty that during a citizen’s arrest, one may use as much force as necessary. Wrong again. Even the police are forbidden to use excessive force, let alone a thug who doesn’t state his intentions and misuses the emergency dispatch system by lying to 911. The police failed to document vehicular vandalism to Humpty's car, let alone impound it as evidence. That's beyond sloppy. It's downright stupid. Humpty now knew law enforcement was more interested in convictions than justice. Meanwhile, he was given an additional bail amount of $100,000 for industrial robbery. In all, Humpty spent a night in jail (like a stray dog in a pound) sleeping with no blanket on a cold concrete floor. It took the police seventeen (17) hours to process his arrest. Bail now totaled $130,000! What if Humpty had been an impoverished, brown egg? Would the same bail have been levied? The officers working at the downtown County Jail shook their heads in dismay that a solid egg such as Humpty (who once worked at that very jail) was obviously guilty. The cop who drove Humpty to jail (as he sat cuffed and boiling in the backseat of the squad car) told him the mug shot he was about to get would be nothing to brag about to his grandchildren. Again, Humpty was being judged. The bailsman did give Humpty a cool, black tee shirt advertising the King Stahlman bail bond company. And because Humpty worked at a State prison, he was given a 10% discount. (Woo Hoo!) Since the accused is required to pay 10% of the total bail amount, Humpty only lost $11,500 ($500 short of a dozen hundred Benjamins). He also had to cough up attorney’s fees (which made his bail look like peanuts), as his dignity was at the hands of the authorities. Damage to his car, a bent driver’s door and replacing the driver’s handle, as it ripped off when Humpty was trying to get away from the mad unidentified assailant, cost him hundreds of dollars. It was becoming clear to Humpty that he had been tried and found guilty at the time of his arrest, which occurred, I remind you, one-half block south of the downtown police station. Having no prior criminal record, (and being in his 60’s) Humpty was now facing two (2) violent criminal strikes. Any inmate can pick up a third (3rd) strike while serving a prison sentence and…B-I-N-G-O! California 's 3-Strikes Law would automatically kick in (like the machine our criminal justice system has become) and Humpty would have to spend the rest of his life behind bars. The California taxpayers would then pick up the annual cost of incarceration, which hovers per inmate somewhere around $47,000 per year. In addition, they would pay for his full medical care, which is priceless. All this for picking up (what he thought) was a discarded object? Had the case gone to trial, Humpty would have been required to pay from $60,000 to over $100,000 in out of pocket expenses. If the interrogating detective thought she had "got her man," she'll soon discover she has egg on her face. 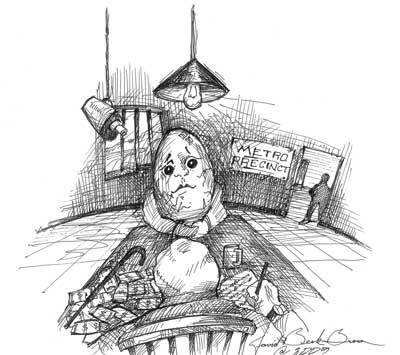 A life-long career working with convicts has turned Humpty into a bit of a hard-boiled egg. He doesn’t crack easily. A flight risk? Not at all. He was raised in this town and his family is buried here. Excessive bail set at $130,000.00 that makes the Eighth (8th) Amendment of the United States Constitution a mockery? Yes! Abuse of police power and misuse of judicial authority must be reined in. the ones etched in the blood of our American patriots. 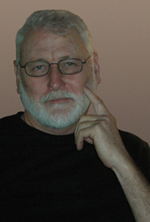 worked with incarcerated inmates from 1977 to 2009 at County, Federal, and California State lock-ups, including the U.S. Government’s Federal Witness Protection Program.